Jill partners with food companies and associations, restaurants, public relations firms and businesses of all sizes. A pro at communicating complex ideas into understandable nuggets in an entertaining way, Jill can write copy for your newsletter, blog, public relations materials, magazine, website and even social media sites like Twitter and Facebook. If you want to boost the health of your employees, talk to Jill about email tips of the day. Working with Jill made my job so much easier. She’s an engaging writer who can communicate complex ideas in a clear, entertaining way and really bring concepts home by showing people simple things they can do to eat and live healthier everyday. 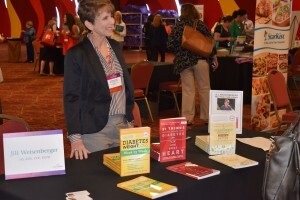 Jill is an extremely knowledgeable and gifted writer on a variety of health topics. She is a pleasure to work with from start to finish, whether you’re brainstorming, needing an assignment done in a hurry or just in need of a fantastic story on almost any aspect of healthy living. I’d recommend Jill Weisenberger to anyone in need of creative, strong health-oriented content.